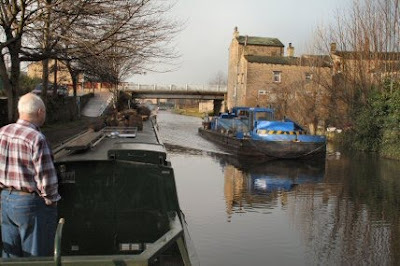 The mooring at Mirfield is quiet apart from the fact that the nearby lane is cobbled and really makes the vehicles rumble as they go along it. Wikipedia -Mirfield -The 13th century St Mary's Church was rebuilt in 1826. However, this church itself proved too small for the growing population, and was also regarded as too mean for the growing district. A completely new church, designed by Sir George Gilbert Scott, was built a few yards to the northwest, on the site of the old Castle Hall, a mansion which was home to the families successively of Mirfields (sometimes spelled Mirfin), Hetons and Beaumonts. The BW workboat Ure passed by this morning. This is only the third boat we have seen on the move since Castleford. I took walk to the nearby boatyard which according to the book has a chandlery. The shop no longer exists and neither does the next boatyard listed in the book having gone bust three months ago. The mole grips will have to suffice for the time being. While chatting to the owner of the yard he mentioned that the flood gates around the corner are closed (probably by the BW boat). I took a walk down and found that the river indicator is on green so it is OK to carry on tomorrow. There are still some buildings from the industrial past to be seen even though they have been given a new use. 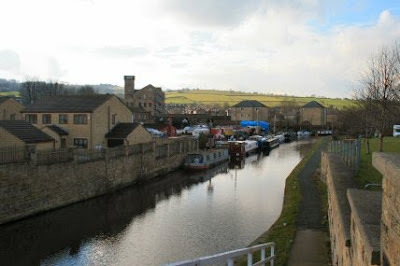 This is the view of the mooring from the other side of the bridge with the cobbled lane alongside. 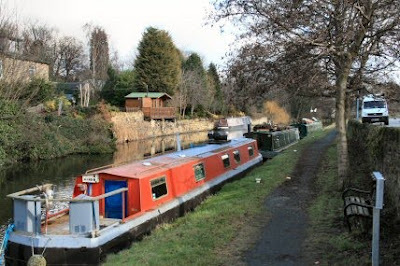 This is a 48 hour mooring and the red boat has been there since three weeks before Christmas. One assumes that there is not much of a BW presence in the area. 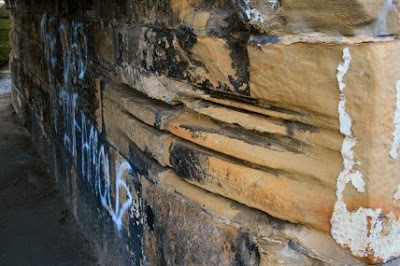 Down at the flood lock is evidence of the the old horse drawn boats with deep grooves in the bridge edge that have been made by the tow rope. At the moment we are heading for Hebden Bridge. The idea being to assist in the Towpath Tidy event on 7th. 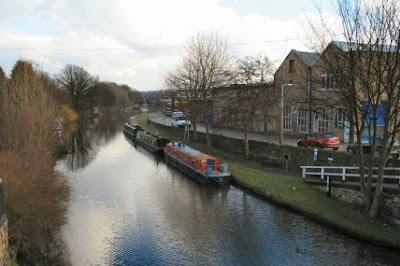 After that we could either carry on along the Rochdale canal or turn around and go up past Leeds and over the Pennines.